Smart Industry Expo 2020 is the perfect opportunity for visitors seeking to learn about digitisation and how to prepare and implement a strategy in this smart era as well as being able to discuss a wide range of issues from components to Predictive Maintenance 4.0, Logistics 4.0, and smart grid technologies amongst others. Other areas covered include: components for IT-based automation solutions that will bring fundamental change to all in-factory processes, IT security, as well as smart technologies that manage and coordinate power, gas and heat networks so that capacity can be balanced and optimally deployed across the entire energy system – integrated energy, plus much more. The event will cover all sectors of industry from industrial automation and energy to predictive maintenance, supply, power transmission & control and R&D. Running alongside will be a comprehensive three-day seminar programme where key industry leaders will explore the various strategies and opportunities that can help UK manufacturers transform to a smart era. Topics covered will range from: smart components, automation components and artificial intelligence, to cloud computing, cyber security, Logistics 4.0, Predictive Maintenance 4.0, real time monitoring & controls, sensor technology and software, plus much more. We are also working to connect shopfloor systems in the DIGICOR Project. Check out the work at www.digicor-project.eu. Many manufacturers will have already considered automating repetitive or intricate tasks. A fair few however, particularly SMEs, are yet to take those first steps. A lack of knowledge and awareness of the specific benefits to be gained is one such barrier. A common misconception is that a huge investment is required. Adoption can and should be done in stages. Often legacy machines will not need replacing but can be adapted. X-STK are experts in control and automation products. 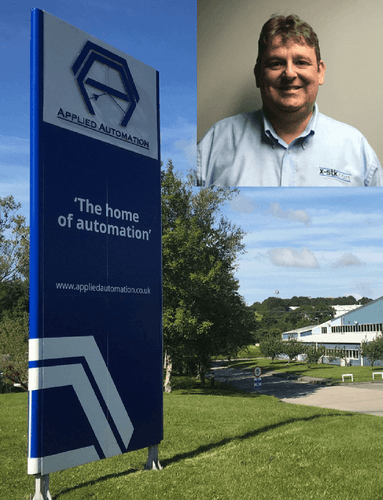 As a division of Applied Automation with over 30 years of machine building experience, there is a wealth of knowledge and experience that can help SMEs find a sensible path towards Industry 4.0 adoption. Sorion’s Guided Assembly Solutions have been designed to maximise quality and prevent mistakes in manual parts picking and assembly tasks. "Most comprehensive and complete event I’ve ever been at. Can’t recommend it enough, it was amazing". Highlights from the 2018 Drives & Controls Exhibition and associated shows.